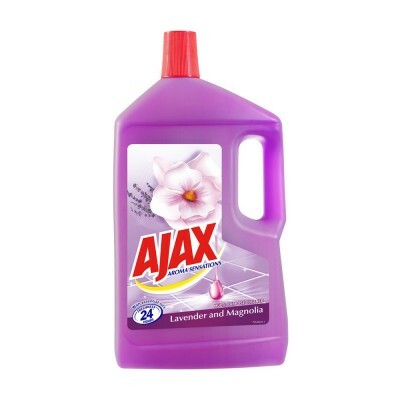 Tags: Ajax, Multi Purpose Cleaner . The relaxing aroma of essential oils from Lavender and Magnolia, directly extracted from the heart of the plant, ensures a unique sensational atmosphere in your home. Discover Sensational and Sparkling clean results for the enjoyment of your family at home. OVERVIEWDiscover Sensational and Sparkling clean results for the enjoyment of your family at home!With natural essential oils: The relaxing aroma of e.. Product Description:With essential oils. Freshness 24 hoursThe relaxing aroma of essential oils from Frangipani and Rose, directly extracted from the ..
With essential oils, 24 hours freshness, For stubborn stains Lavender and Magnolia Multi-Purpose Cleaner24 hours* freshness* Based on lab testDiscover..
Ajax Fabuloso Antibacterial effectively removes grease. Cleaning with Ajax kills 99.9% bacteria from your household surfaces leaving your floors and h..